Leona Lewis & Rachel Platten Buddy Up at Just Jared's Halloween Party! Leona Lewis and Rachel Platten look so amazing while in costume at the 2016 Just Jared Halloween Party held at Tenants of the Trees on Sunday (October 30) in Silver Lake, Calif. The two singers got all dressed up to celebrate the holiday – Leona was a fortune teller and Rachel was an angel. Rachel was joined at the event by her husband Kevin Lazan. Other music stars in attendance included Frankie, Fancy Hagood, Fletcher, Symon, Nash Overstreet with his brother Chord (pictured below), Ryan Beatty, Gabe Sporta, Bonnie McKee, Zane Carney, and The Struts‘ Jed Elliott, Gethin Davies, and Adam Slack. Guests at the event, including Frankie and her band, snacked on Pasta Chips throughout the night. FYI: Rachel carried a Milly clutch with her costume. Brandon Lee goes shirtless and puts his toned body on display while hanging out in the pool at the 2016 Just Jared Summer Bash presented by Uno on Saturday (August 13) at a private residence in Beverly Hills, Calif. The 20-year-old model and son of Pamela Anderson looked like he had a blast at the event, which overlooked the amazing views of the city landscape. Also in attendance at the party were model Aliana Lohan, and music stars like The Struts‘ Gethin Davies and Jed Eliott, Ryan Beatty, Zane Carney, Nash Overstreet, Johann Vera, and Sofia Reyes. The party celebrated the classic card game Uno and the estate was decked out with the game’s signature colors. 4′ letters reading “JUST JARED <3 UNO” lined the edge of the property and created a picture perfect moment for our guests. 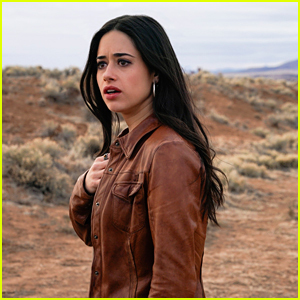 The 'Roswell, New Mexico' Season Finale Airs Tonight!